I moved to Seattle last year to attend a school that’s located downtown, and on grad-school budgets my friends and I have learned to navigate Pike Place Market to enjoy the best it has to offer without sacrificing the experience or the epic Instagram photos! Whatever you do, DON’T PARK AT PIKE PLACE. Parking is a nightmare and if you find a spot it can cost up to $50 to park for the few hours you’ll want to spend at the market. If you aren’t already a member of a ride sharing app, signing up before your Seattle trip can get you free rides on Uber if you use the right promos to sign up. Lyft will give you $50 in free rides by using this link to sign up and Uber gives $20 in free ride credits if you use a referral. Ride sharing apps are the ideal way to navigate downtown Seattle, where you can get picked up in a minute or two without the headache of downtown traffic or parking. 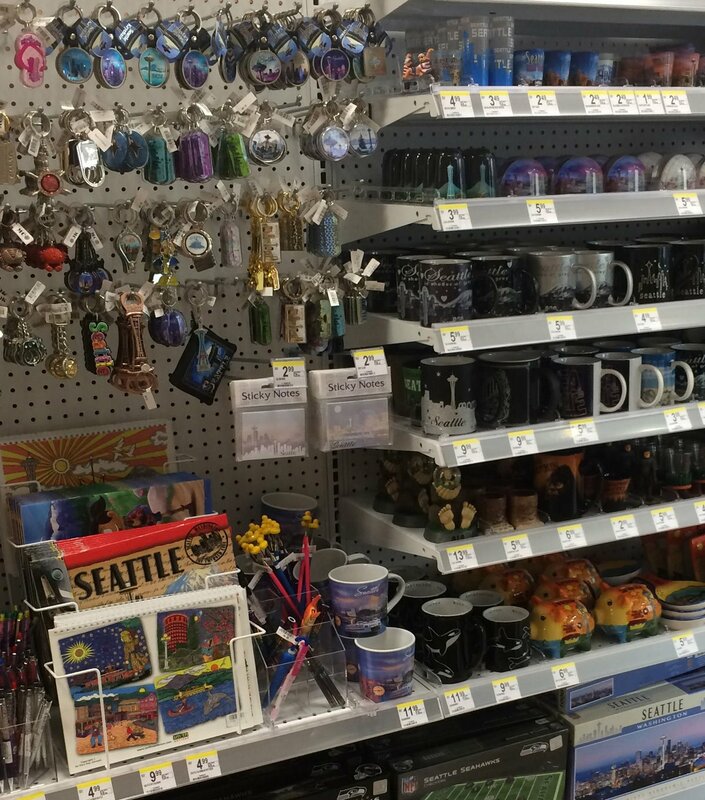 (magnets, totes, etc) at a better rate, hike two blocks up the waterfront on Pine St to Walgreens, where the corporate owned drugstore has a selection of imported junk that says “Seattle” with all the kitsch for a notably lower price. If you or your significant other has a quirky sense of humor, head to the Gum Wall for free souvenirs. Yep. Dried Gum. It’s memorable, part of the landscape of the Market, and a super gross object to remember your trip by. And trust me, no one cares if you peel a piece off the wall. Market Rummage Hall is a second hand store located inside the streetside market building, enter the interior of the market via the entrance beside Pirosky Pirosky, then turn left at the cigar shop. The Rummage Hall is rented daily by varying vendors, so contents often vary in type and price, but I’ve snagged some great finds here. Food is central to the experience of the Market, below are some tips to save money while experiencing the culinary culture of Pike Place. Don’t forget your water bottle! Extra important at Pike where drinks can be expensive. Plan for a picnic. Sit down restaurants & even food stalls at pike can be very expensive. Cut costs by packing part of your lunch and picnicking on the waterfront side of the market, or in the hidden away rooftop community garden. If you wander long enough, you can almost make a meal out of free samples. Fruit vendors, the BBQ stand, Beecher’s Cheese, Le Panier, and many other vendors offer small samples of their product. Group Tip: there are many food counters in the market and many are happy to cut a sandwich into halves, thirds, or even quarters so you can experience more while spending less. The most affordable meal I’ve found at Pike Place can be found at the Mexican Grocery store located right next door to the “Original” Starbucks. For under $5, you can get a pork, chick, beef, or veggie tamale with beans, rice, and chips. 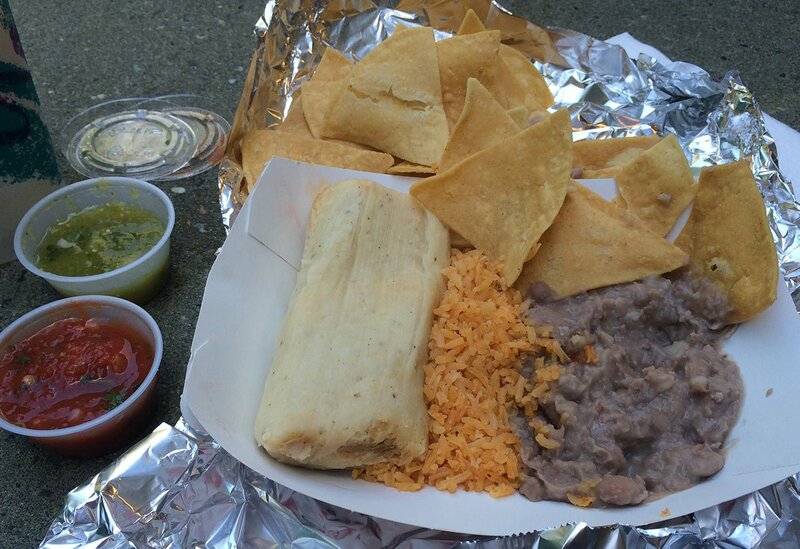 cheap eats at pike place: this meal from The Mexican Grocery rings up for under $5. Check out my Insider’s Guide to Pike Place for more details on “stuff to do” while you are there.